Wikileaks has become increasingly adept at getting attention for its publication of information other people would prefer to remain secret, with julian Assange being all over the TV and newspapers this week after releasing a huge volume of classified US documents about the war in Afghanistan. The BBC has a story on the event - 'Hidden US Afghan war details' revealed by Wikileaks. More than 90,000 leaked US military records have been published on the website Wikileaks, reportedly revealing hidden details of the Afghanistan war. Three major news publications which have been shown the documents say they include unreported killings of Afghan civilians. The huge cache of classified papers is described as one of the biggest leaks in US military history. The White House has condemned the leaks as "irresponsible". Reports by the UK daily The Guardian, the New York Times and the German weekly Der Spiegel say the leaked papers reveal Nato concerns that neighbouring Pakistan and Iran are helping Taliban insurgents in Afghanistan. The Pakistani ambassador in Washington said the "unprocessed" reports did "not reflect the current onground realities". "The United States, Afghanistan and Pakistan are strategic partners and are jointly endeavouring to defeat al-Qaeda and its Taliban allies militarily and politically," said Husain Haqqani. * The Taliban has had access to portable heat-seeking missiles to shoot at aircraft. * A secret US unit of army and navy special forces has been engaged on missions to "capture or kill" top insurgents. * Many civilian casualties have gone unreported, both as a result of Taliban roadside bombs and Nato missions that went wrong. The BBC's diplomatic correspondent Bridget Kendall says that although the documents reveal no dramatic new insights, they show the difficulties of the war and the civilian death toll. Dan Gillmor at Salon has a look at the implications for Wikileaks as the US Government tries to re-establish its control over who has access to information - The WikiLeaks war logs change everything. It's hard to escape the sense that we've hit one of those historical pivot points in the wake of WikiLeaks' release of the Afghanistan war document trove. ﻿The conduct of politics, war and media -- so intertwined these days -- has changed irrevocably. If he was contemplating the same decision today, Ellsberg said in April, he'd just scan the documents and put them online. But just posting documents isn't enough. While media are becoming democratized, there's still the matter of getting people's attention beyond a small circle of those who care deeply about any given topic. You want the biggest bang for the buck, you still take your story to the media organizations that will give your story a ride. So the fact that WikiLeaks'' Julian Assange gave an early look at the documents to three selected organizations -- the New York Times, the Guardian and Der Spiegel -- is proof of his incredible savvy at how traditional media actually operate. In a recent New Yorker profile, he lamented the general uninterest he perceived among journalists when it came to huge stories. ﻿When everybody has the story, he realized, they don't care much about it. When a few selected journalists at major institutions get it first, that's how you create buzz. This says more about journalists' competitive instincts and their Pavlovian response to "exclusives" than it does about their willingness to actually do their jobs for their audiences. Second: WikiLeaks' roles -- intermediary, publisher, P.R. agent and more -- is not utterly unprecedented, but the size and importance of this story takes the shifting changes in media to new levels. (Do read Jay Rosen's smart instant analysis on all of this.) What do we make of such a "stateless news organization," as Jay elegantly puts it, which works so hard to subvert so many media assumptions of the past? Even though the New York Times took huge care in what it printed, and kept some of the material out of its own reports at the request of the Obama administration, a newspaper's redaction is not very important if WikiLeaks puts out everything on its own. ﻿We have delayed the release of some 15,000 reports from total archive as part of a harm minimization process demanded by our source. After further review, these reports will be released, with occasional redactions, and eventually, in full, as the security situation in Afghanistan permits. We've become accustomed to seeing traditional news organizations delay publication or broadcasts at the request of governments. The New York Times, you'll recall, held off for more than a year when it came to telling the American people about the Bush administration's illegal surveillance of our communications -- a decision made in what the paper considered journalistic good faith but which to many of us was an outright betrayal of the craft. Journalists also do what sources demand, if that's what it takes to get stories. This is why so many articles have so many unnamed sources. In this instance, WikiLeaks is holding back, at least temporarily, to keep its source happy. You and I can't judge whether this is really about minimizing harm or something else. We have to take WikiLeaks at its word, for now. One reason we may be more inclined to do so is the promise that these new documents will be released in full at some point. Third: A week ago -- seems longer, doesn't it? -- the Washington Post ran a superb series of articles on how America's national-security state is emerging from the 9/11 paranoia, a "Top Secret America" that is at once terrifying and expected given the public's twitchy fears and politicians' eagerness to cater to our worst instincts. We learned that almost 900,000 people holding "top-secret" clearance are part of an apparatus that almost certainly spies on everything and everyone it can identify as even remotely, potentially, possibly suspicious -- with no real oversight. ﻿Whatever our keepers of intelligence secrets do know, and whatever abuses they've done to our civil liberties to learn them, they must feel less sure today about keeping it all contained. When that many people have access to information, however compartmentalized their bosses may think they've made the system, some of it will get out, which leads to something else we should worry about. Fourth: The WikiLeaks war diary will absolutely spur our powerful institutions to look for increasingly draconian ways to clamp down on how we share information. What WikiLeaks represents is what governments and corporations fear: a threat to their cultures of secrecy and dominance in their domains. Look for Washington and our corporate media to call for new laws to stop this kind of thing. Politicians and bureaucrats who don't trust us to know what's really going on -- they are legion in both major parties -- have allies among the traditional media and the entertainment industry that would gain enormously if the Internet were to be turned into a slightly more interactive version of 20th century print and broadcast media. If you think the rich and powerful people who run governments and corporate media aren't working every day to turn back the clock on information they can't control, you're not paying attention.﻿ WikiLeaks may well have given them new ammunition for pushing the harshest kinds of restrictions. Do we want to be like Saudi Arabia and China? We may find out one of these days, sooner rather than later. Finally, this: I have donated money to WikiLeaks in the past. I plan to donate in the future. ﻿What Assange and his team are doing is an inevitable result of what technology has brought us in democratizing our media. Some of what they do troubles me. But the bottom line seems to be this: They are performing a public service. Julian Assange recently did a TEDTalk on Wikileaks - Julian Assange: Why the world needs WikiLeaks . The SMH reports that the source of the documents was anonymous WikiLeaks chief in the dark over who leaked data. 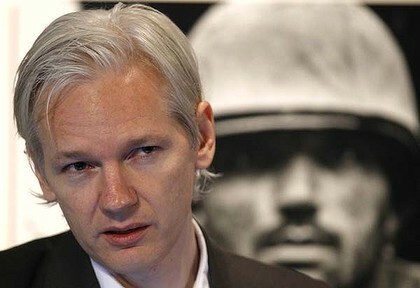 WikiLeaks' editor-in-chief claims his organisation doesn't know who sent it some 91,000 secret US military documents, telling journalists that the website was set up to hide the source of its data from those who receive it. Julian Assange didn't say whether he meant he had no idea who leaked the documents or whether his organisation simply could not be sure. But he did say the added layer of secrecy helps protect the site's sources from spy agencies and hostile corporations. "We never know the source of the leak," he told journalists gathered at London's Frontline Club. "Our whole system is designed such that we don't have to keep that secret." While Assange acknowledged that the site's anonymous submissions raised concerns about the authenticity of its material, he said WikiLeaks had yet to be fooled by a bogus document. Assange agreed that the files offered insight into US tactics. But he said that was none of his concern, and he noted that his website already carried a copy of the US Special Forces' 2006 Southern Afghanistan Counterinsurgency Manual, among other sensitive US military documents. "It is not our role to play sides for states. States have national security concerns, we do not have national security concerns," Assange said. He said he wasn't interested in the safety of states, only the safety of individual human beings. "If we are talking a threat to individual soldiers... or citizens of the United States, then that is potentially a genuine concern," he said. Assange also offered insight into his own motivation, referring to a statement he gave to German newspaper Der Spiegel in which he said he "loved crushing bastards." He said the comment wasn't meant in jest, describing himself as a combative person who likes "stopping people who have created victims from creating any more." Assange also expressed disdain for the military, alluding to a statement attributed to Albert Einstein, a noted pacifist, which describes soldiers as contemptible drones and attacks patriotism as a cover for brutality and war. He scoffed when the Frontline's moderator spoke of teenage British soldiers "giving their lives" in Afghanistan. "To what?" he asked. Technology Review has a look at how data sources could be marked to identify whistleblowers - The Hunt for the Wikileaks Whistle-blower. Attorney General Eric Holder's new probe into Wikileaks's posting of 91,000 war documents will likely find that tracing the path of the documents back through the Internet is next to impossible. But watermarks--if they were embedded in the files--could reveal the whistle-blower. Wikileaks relies on a networking technology called Tor, which obscures the source of uploaded data. While Tor doesn't encrypt the underlying data--that's up to the user--it does bounce the data through multiple nodes. At each step, it encrypts the network address. The source of data can be traced to the last node (the so-called "exit node"), but that node won't bear any relationship to the original sender. Ethan Zuckerman, cofounder of the blogging advocacy organization Global Voices, says he doubts investigators can crack Tor to find the computer from which the documents were originally sent. "There's been an enormous amount of research done on the security of the Tor network and on the basic security of encryption protocols," he says. "There are theoretical attacks on Tor that have been demonstrated to work in the lab, but no credible field reports of Tor being broken." And while Tor's profile has been raised by its association with Wikileaks, Andrew Lewman, Tor's executive director, says he has no insights into the source of the purloined documents. "I don't know how Wikileaks got any of the information," he says. While Wikileaks gets technical help from Tor staffers, "they don't tell us anything, other than 'Did we set up the hidden service correctly?' which we'd answer for anyone," Lewman adds. "People assume that Wikileaks is a Tor project, but I can tell you definitely there is no official relationship." One way the government could finger a leaker is through digital watermarking of the documents themselves. James Goldman, a cyber forensics expert at Purdue University, says it's not clear whether the government uses digital watermarking, "but it's certainly possible." Kevin at Cryptogon has a little essay on the reliability of Wikileaks as an information source, noting it could genuinely be what it claims (a Shockwave Rider inspired entity dedicated to revealing government and corporate data) - or that it could be just another (well publicised) source of disinformation. An alternative explanation would be the data being fed to it is part of what William Gibson dubbed America's "cold civil war", with the liberal faction happy to have a way of discrediting their foes. Cryptogon - WikiLeaks Founder, “Constantly Annoyed that People Are Distracted by False Conspiracies Such as 9/11″. My response is always: TREAT EVERY SOURCE AS DISINFO. You’ll avoid disappointment when the thing starts serving up rat poison—which, unfortunately, happens a lot. I haven’t shared this before, but in early 2008, someone from WikiLeaks wrote to me. This person wondered why I hadn’t mentioned WikiLeaks on Cryptogon. He wondered if maybe I hadn’t heard of it, or had concerns that it was a front of some sort. I simply wrote back that I was aware of WikiLeaks, and that I was hopeful and skeptical at the same time. That remains my stance today; on WikiLeaks and every other source. So, who knows… I’ve read interesting things on WikiLeaks, many of which I have linked to from here. Does that mean that I’m sure it’s not some kind of front or honeypot? Not at all. How could I know for sure, given what’s knowable in the public domain about WikiLeaks? 1. He is profoundly ignorant of the vast body of material that demonstrates that the 9/11 spectacle was a false flag operation. Of these three options, I doubt that it’s number two. Also, I’m aware of all the stuff John Young has up over at Cryptome from some anonymous mole on a private WikiLeaks list. Again, who knows. Vet the data as you would anything else from any source. Use your skills of discernment. For me, the most worrying thing about WikiLeaks is the promotion it receives from the corporate media. Even the trash talking Wired is promoting Wikileaks by constantly mentioning it. In the end, though, obsessing about disinfo this and disinfo that is generally a waste of time. It’s safe to assume that damn near everything we come across contains disinfo. We just saw the WikiLeaks release of the Afghanistan information, does Assange forget the pretext that was used for the invasion? 9/11 remains the elephant in the room. I don't believe everything Kevin writes but at least he isn't part of the LaRouchie circle jerk tinfoil world.